Kesarbai Kerkar was born in Keri, a small village in North Goa. Being born in a family that depended on music for its livelihood, she was thrust into the field of music at a very tender age. 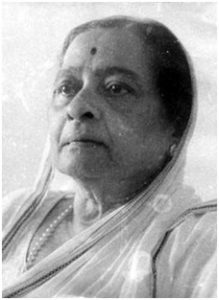 Her family was very encouraging of her musical talents, and at the age of eight Kesarbai spent 8 months in Kolhapur under the tutelage of Abdul Karim Khan, the legendary musician of the Kirana gharana. After returning to Goa, she learnt for two years from Ramkrishnabuwa Vaze, the senior Gwalior gharana musician. In 1908, Kesarbai along with her mother and uncle came to Mumbai in her quest for music, where she met a wealthy merchant, Seth Vitthaldas Dwarkadas, who helped her get in touch with Barkatullah Khan, the Senia gharana sitar maestro and court musician in the Patiala durbar, under whom she learnt intermittently during his stints in Mumbai. In 1912, Kesarbai requested Alladiya Khan to teach her, when he stayed in Mumbai for a short period. He agreed to teach her, but she could not grasp much of his vocal style in the limited time. He was forced to leave for Kolhapur due to ill-health, and subsequently, Kesarbai continued her study with Barkatullah Khan who spent his vacation from the Patiala princely court in Pune and would visit Mumbai periodically. But, this training also did not last for long, as Barkatullah Khan took up service at the Mysore princely court and became extremely busy. A year later, she turned to Bhaskarbuwa Bhakle, the legendary musician, from whom she studied for a short, period, but this too was terminated as Bhaskarbuwa had to move to Pune to take charge of the Bharat Gayan Samiti. She once again learnt from Ramkrishnabuwa Vaze for a short while. Kesarbai’s training was intermittent till 1917, and after an unsuccessful concert in 1918 she resolved to learn again from Alladiya Khan himself and no one else. He refused at first, but Kesarbai approached Shahu Maharaj, the king of Kolhapur and Alladiya Khan’s patron, with whose persuasion he reluctantly agreed to train Kesarbai after laying down the strictest of conditions which included matters of riyaz, fees and other things. The ganda-bandhan ceremony took place on 1st January, 1921. Khan sahab gave her rigorous taleem for 8 hours every day, continuously for a period of 11 years. He was very particular about her voice-culture and ensured that she became pitch-perfect by making her repeat the same taan or palta hundreds of times. He also gave her ample opportunities to provide vocal accompaniment to him in his concerts. Later on, due to his deteriorating health, the hours were reduced, but he taught her a period of 27 years, till his death in 1946. Kesarbai started performing by around 1931 and soon her fame spread to all parts of the country. Her chief asset was her firm, flexible, polished, well-trained voice and she had an unwavering command over it. She often sang without microphones because her voice was “big enough” to suffiently convey the subtleties of her music without it. Her gayaki had all the special features of the ‘Alladiya Khan gharana’ (Jaipur-Atrauli gharana) – such as rendering the Khayal mostly in the Vilambit and madhyalaya, systematic elaboration of words interwoven with rhythmic patterns, a rounded and open Akaar, and a preference for anvat, jod and sankeerna ragas. She also sang semi-classical froms such as Thumri, Hori, Dadra, etc. occasionally. Babanrao Haldankar, in his book ‘Aesthetics of Agra and Jaipur Traditions’, writes that her gayaki which in the earlier days leaned heavily towards taankaari, underwent a profound transformation later displaying great maturity as can be seen in her performances where she devoted more time to raag-vistaar, giving a minor role to taankaari. He also observes that she was influenced by Faiyaz Khan, the Agra gharana maestro, especially in her employment of bol and in her renditions of Thumris. Kesarbai’s alaaps and taans were systematic and well arranged, all coming on the Sam with perfection. Her famed dum-saas drew great appreciation from other musicians and music critics, and still does, from the listeners of today. Her cascading and forceful taans have been compared to “jets of water from a fountain” and to “fireworks which shoot up high, and come down in a burst of colours”. Her carefully assembled clusters of note-combinations have been likened to “precious gems spread out against a velvety background”. Vazebuwa (one of her Gurus) has compared her music to “a bouquet of fragrant flowers sprinkled with costly ittr (scent)”. She was truly a musicians’ musician. She only accepted and taught one disciple: Dondutai Kulkarni. Kesarbai retired from concert singing in around 1965 when she felt that her voice was failing her, as she was very conscious of her performing career and did not want to compromise on the quality of her music. Kesarbai was bestowed with numerous honours in her long and illustrious musical career. Her performance at the residence of Rabindranath Tagore in Calcutta, in 1938, was greatly appreciated by the Nobel laureate, who, in his hand-written letter to her, described her music as “an artistic phenomenon of exquisite perfection” and bestowed on her the title of ‘Surashri’. The Sangeet Natak Akademi Award was conferred upon her in 1953. The Government of India awarded her with the Padma Bhushan in 1969. The Government of Maharashtra awarded her the title of ‘Rajya Gayika’ in 1969. She received patroniage from the royal houses of Kashmir, Baroda, Kolhapur, Jaipur and Jodhpur. Her 78 rpm recording of the Hori ‘Jaat Kahaan Ho’ in the raga Bhairavi was chosen by Robert E. Brown to be included in the Golden Record which is now being carried by the Voyager (launched on 5th September, 1977), a space probe on a mission of exploring the outer solar system. Brown believed that the recording was the finest recorded example of Indian music. It is the only song from India that has been immortalised alongside the music of Beethoven, Bach and Mozart on the record. Kesarbai also cut several L.P. recordings with Broadcast Records (in 1935, she cut eight double-sided performances, some lasting nearly twice the normal duration for 78rpm discs at the time. These scarce discs, some lasting 8 minutes per side, have been reissued on CD in India by Underscore Records), and later for the then-biggest recording company in India, HMV (between 1944 and 1949, she cut twelve performances issued on six 12” discs. 9 of those can be found in this link:https://canary-records.bandcamp.com/album/kesarbai-kerkar-1944-1953. She recorded another series of fourteen performances for HMV between 1953 and 1955, which remained unreleased due to misunderstanding between Kesarbai and HMV, after which she swore that not only would she never set foot in HMV’s recording studios ever again but also that she demanded that the records she made for them never be played again on the single largest venue for music in the country, AIR. Her voice was still broadcast in Goa until 1961 when it was annexed by India from Portugal, at which point her voice when silent from the airwaves there, too). Dhondutai Kulkarni has trained several disciples to carry forward her illustrious lineage. The ‘Surashree Kesarbai Kerkar High School’ now occupies the site of her former second home, in Keri, and the house where she was born still stands, less than one kilometer away. A music festival called the ‘Surashree Kesarbai Kerkar Smriti Sangeet Samaroh’ is held in Goa each November, by Kala Academy, Goa. A music scholarship in her name is awarded annually to a student of the University of Mumbai by National Centre for the Performing Arts (NCPA) via the Kesarbai Kerkar Scholarship Fund. Kesarbai is still fondly remembered and revered as one of the most iconic musicians in the history of Indian music. Kesarbai passed away in Mumbai on September 16th, 1977, leaving behind a rich legacy.